First and foremost...this is not a massage. This is Soulmatic Therapy...Soul+Somatic+Therapy. An in-depth collaborative excavation of your body-mind-spirit which includes your emotional and psychological traumas that are stored in your body. Through rigorously honest dialogue, breath work and attuned deep tissue bodywork we create an experience that can change your life. We can unearth your purpose and fine tune your energy to be able to take your life into your own hands. To manifest your dharmic path and truly be of service for the greater good. Most people spend a lot of energy and time avoiding their pain (which causes more pain), not to mention all the ways we are in denial and delusional about how truly out of control we really are. We have inherited a plethora of unconscious behaviors and traumas from our families and society. It isn't our fault and it is our responsibility to do the work our parents couldn't do. To wake up and evolve. I specialize with people in crisis and/or transitions. This work is not for the light hearted. As Joseph Campbell said, "the dark cave you do not want to enter holds the treasure you seek." This work is just that...we will go into that dark cave you have been avoiding for years and bring to light what has been sabotaging you this whole time. Are you ready? If you are...COME! Watch the video below and see if it is time. Teaching in San Francisco, CA. at Yoga Tree with Mark Morford. In Madison WI., teaching a workshop with Mark Morford at Perennial Yoga. 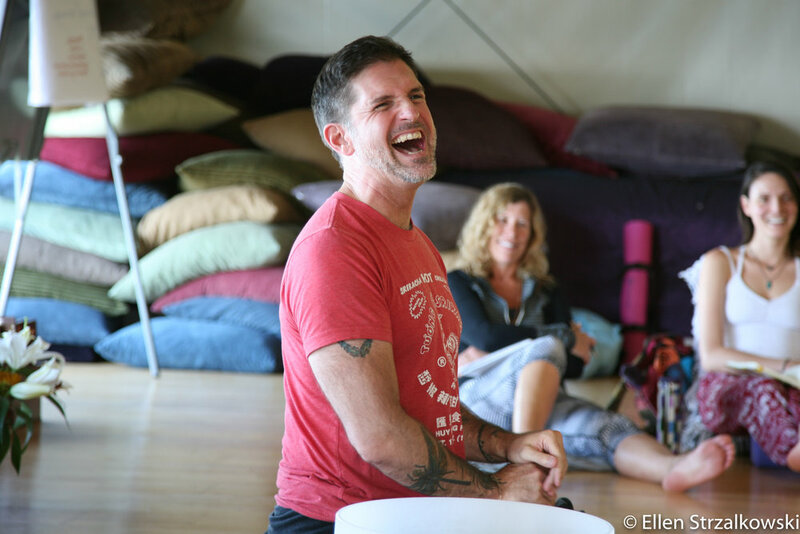 Teaching my Anatomy of Emotion Workshop at Temple Yoga in my hometown of Reno, NV. At Lake Atitlan, Guatemala teaching Qi Gong on the dock at Our annual Yoga Alchemy retreat. At a fire ceremony in Southern India with a Janet Stone Yoga Retreat. Feelings buried alive never die. *Dynamic lecture and group exploration of The Chinese Five Element Theory, and how it bridges the physical, emotional, psychological and spiritual dimensions of being human. *Interactive exercises to deepen and broaden one’s bodily knowledge and wisdom. *Meridian---Muscle---Emotion connections and spiritual qualities embedded within these connections. *Self-Care Techniques to include Stretching, Qi Gong and Massage. *Meeting the Shadow - an introspective investigation and inquiry into the parts of us that got left behind and techniques that can turn this unintegrated piece into a very powerful ally. *Transformational Bodywork Demonstrations – Mark will choose volunteers on which to perform his work, allowing workshop participants to witness firsthand what actually is trapped in our tissues. There will be about 3 or 4 demos of this powerful work to assist the participants in seeing what actually is trapped in the tissues as well as what is lurking underneath the floorboards of one's daily consciousness. This will be the most dynamic part of the workshop and not to be missed. All information will be presented in an easy and digestible fashion with humor and spontaneous relevance. Anyone is welcome to attend. No prior experience is needed in any field, all you need is to have a body. July 7th-13th- A Janet Stone Yoga Greek Island Retreat: Limited space is still available. Spring 2019: Planning an East Coast Anatomy of Emotion workshop in New Jersey with two weeks of private bodywork sessions. Dates and details coming. The tradition of prayer beads began in Ancient India around the 8th century B.C.E. The seers needed a tool to help them focus and calm their mind for the meditative state. They created japa mala (japa meaning “repetition” and mala meaning “garland”) consisting of 108 beads to help them keep track when repeating mantras. The use of these beads spread throughout the continent, peoples and religions alike. When the Roman Empire began trading with India, the word japa was misunderstood by the Romans as the Latin word jap, meaning “rose”. When the beads came to be used in Rome, they were known as rosarium and eventually in English, rosary. In ancient Vedic culture 108 is believed to be the number of existence. There are 108 sacred texts, 108 sacred sites around India, 108 marma points of the body and 108 lines of energy that converge to form the Heart Chakra. There are 9 planets and 12 astrological houses, 9x12=108. The list goes on… Wearing your mala during meditation, or simply having it near you, on your altar can be a focus point for your practice. It can help clear the distractions before meditation. In the spring of 2015 Mark launched The Soul Whisperer Project a 6 week, 7 city cross country healing tour filming a documentary about the somatic based trauma therapy called Transformational Bodywork. Go to the Blog to see the vignettes and snippets from the journey thus far. January 2016 we hit the road again. This time we were out on the road for 7 months, 17 cities in North America, over 17,000 miles, 8 Anatomy of Emotion Workshops (173 participants), over 160 private bodywork sessions and 30 states. It was a doozy of a journey and such an amazing adventure. Central to every session, this technology amplifies the energetic nature of Mark's approach. It increases circulation, facilitates relaxation, and harmonizes the cellular functions of the body. Learn more HERE. To purchase go HERE. Nutrition is a major factor in ones vitality and longevity. Body Balance, a liquid whole food supplement, has been a cornerstone of my health and wellness ritual for over five years now. With SeaNine a phytonutrient-rich blend of Aloe Vera & nine sea vegetables. Learn more here. First time clients must schedule a 2 hour session. If you schedule any other time it will be canceled. If you cannot find a time slot or day that works for you please email me and we can collaborate to carve out a spot that fits. Thank you very much and I do look forward to working with you.